I've been wearing grooves in the Jersey Turnpike lately, running back and forth to book-related events. And the misadventuring continues: this coming Friday (October 3) I'm Lawn Guyland bound. I'll be reading a mix of poetry and prose at 7 p.m. at a coffee shop called Sip This. The location is 64 Rockaway Avenue, Valley Stream, NY. After that I'll be heading in the general direction of home to sign books the very next day (Saturday, October 4) at the Cumberland Mall in Vineland, New Jersey. I'll be at the Books-a-Million from 2-4, and I'd love to see you there, Jersey friends! This Thursday (September 25), I'll be joining a panel of fabulously talented writers at New York University (Fales Library and Special Collections, 70 Washington Square South, 6 p.m.). We'll celebrate the relationship between literature and food, and the release of Books That Cook: The Making of a Literary Meal. If you happen to be in the big city, please drop by for some gustatory and literary delights. In the meantime, to whet your appetite, here is a selection from Books That Cook by poet/photographer Howard Dinin. 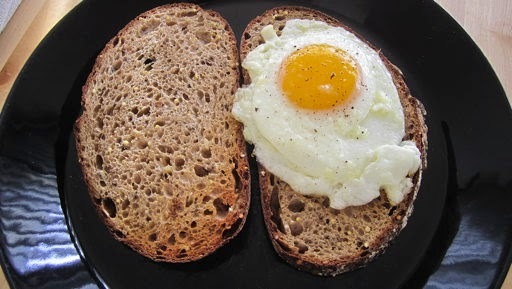 If you follow its instructions, you too may enjoy the perfect fried egg sandwich. Dust to dust. A sustainer. a meal, even for the dying. It may be the simplicity. the one the dying prefer. Let the one dying add the salt. the eggs of the alphabet. and swallow one at once. No looking at the clock. the egg the female cell. to start, once you start. The only color is the yolk. and slide the egg out. so the egg slides free. the fat to top the yolk. plate one slice for sure. and leave the fat behind. if that’s what’s called for. When I read his tag and realized he was an eland--the world's largest and slowest antelope--my heart skipped a beat. I've long been fascinated by Randall Jarrell's "Seele Im Raum,"--German for "soul in space"--a moving and mysterious poem in which an eland stands for how what we imagine can feel far truer than any literal truth. It sat between my husband and my children. A place was set for it—a plate of greens. Not seen it so that I knew I saw it. Not seen it. It was an eland. When I could no longer speak, but only breathe. And a canvas marquee the last brown of earth. It was a word one translates wretched. —It was worse than impossible, it was a joke. —It was not even a joke, not even a joke. And the eland comes and grazes on its grave. Choose either—I cannot do both. To be at all is to be wrong. "This is an antimacassar that I grew from seed." After yesterday's book signing in Lancaster, Pennsylvania, Andre and I set off a little adventure with our son Eli and his girlfriend Samantha. Our first stop was Mullen Books, Inc., in Columbia, Pennsylvania, a homey river town not far from Lancaster. 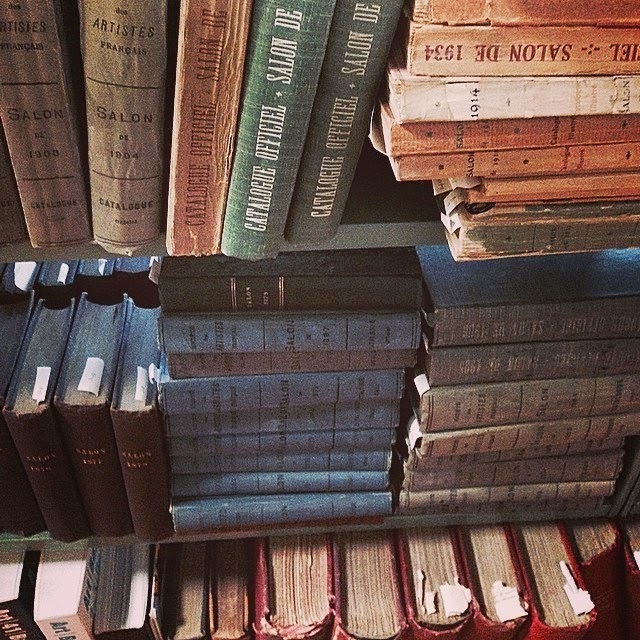 But the main attraction at Mullen Books, Inc., is, of course, the books. Kevin's stock is varied, but at its heart is the most enormous, enticing collection of art books imaginable. Naturally, I couldn't help wandering off into the stacks to do a little browsing. Labels: art, books, Elizabeth Gaskell, James Mullen, Mullen Books Inc.